© gold-quote.net. All rights reserved. This is not real gold, instead this is copper-plated gold. Short-term investments are very bullish, erratic, unpredictable and undependable. But, long term investments are, relatively, considered safe and reliable. Precious metals like gold and silver are considered to be true money, and governments have been bastardizing precious metals since the night of time. It's all about printing fake money anyway. Even as stocks were losing their value, gold was marching steadily, increasing by five percent in US dollars. However, this 'buy and hold' strategy might not work anymore as the sub-prime crisis has shaken this belief in the long term investment mode. Now, has gold joined the bandwagon of safe long-term investment going awry by treading the path of the sub-prime crisis? This October, bankers in Hong Kong were in for a rude shock when they discovered some gold bars from the US to be actually gold plated tungsten i.e., fake gold bars. Acting fast, the Chinese officials found the perpetrators within hours. It seems that fake Tungsten blanks, between 1.3 and 1.5 million 400 oz, were manufactured in the US about fifteen years ago during the Clinton administration. Said to have been done by a very sophisticated refiner, 640,000 of these tungsten planks were gold plated and shifted to Fort Knox. The remaining also gold plated, but sold into the international market. (Fort Knox , as you may be aware, is the United States Bullion Depository, where the official gold reserves of the federal government are stored. This depository of about 4,603 tons (4 176 metric tonness) is the second highest gold depository in the US after the Federal Reserve Bank of New York's underground vault in Manhattan (5,000 metric tonness of gold). Whoever pulled this one on the gold bars had connections inside the government, big banks and also a top-of-the-line fabrication facility. For, counterfeit is not something new for the US government, it did this is 1964 when zinc dimes clad in silver were introduced. That's why the pre 1964 coins are valued more. Elsewhere, early this year, another counterfeit story made rounds as some of the gold bars in the vaults of the National bank of Ethiopia were found to be gold plated steel. It made news when the shipment of gold was returned by South Africa. It only could have been the work of a genius as fake gold bars made of steel are among the easiest to detect as they are lighter. Among gold coins, 22k Gold coins such as Krugerrand, are less likely to be counterfeited because the density of 22k gold minted from gold alloy that is 91.67 percent pure, is far apart from that of tungsten. Tungsten has the same density (19.25g/cm3) as gold, so a fake bar is indistinguishable by weighing it. 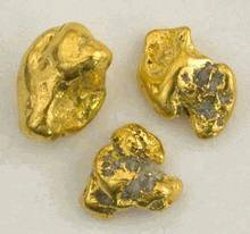 In comparison the density of pure 24k gold is within 0.26% of tungsten. The table above illustrates that although tungsten's density is within 0.26% of pure gold making it nearly impossible to detect, it is nearly 5% heavier than the 22 karat gold of Krugerrands. The dimension differences of a counterfeited 22 karat coin would have to be 6 times larger than those of a pure gold coin to weight the same. So one is 6 times more likely to detect a counterfeited 22k coin or piece of jewellery than a counterfeited pure gold bar through simple measurement. So just by weighing the coins you would tell a difference. So why aren't so many fake coins in the market? Coins are more liquid and circulated; they change hands more readily so it's more likely a fake one will be detected. Gold bars on the other hands are given as little exposure to human hands as possible (fear of theft). They are conveyed in armored trucks, their serial numbers are exchanged and they're stacked away in a vault never to see the light of day again. Their credibility relies on a piece of paper and paper is easy to forge. Also the labor involved in making fake coins does not make it as worth a criminal's time as a gold bar. (it costs $50,000 to make a fake $400,000 gold bar because of the real gold coating and the labor). Gold coins have lots of details including the number of ridges on the sides etc..and there are a lot of numismatic aficionados out there to tell a real from a fake. Tungsten is a steel-gray metal found in shallow rectangular deposits. It has a very high melting point and is brittle making it hard to work with when it's raw. Today, companies like Chinatungsten use Tungsten in jewellery making and in memorial coins. Chinatungsten even offers tungsten alloy as gold substitute. Chinatungsten even brags, on its website, about being an "accustomed experts in fabricating tungsten bars and discs coated with gold." It's a large scale operation, indeed. The question is since only high-end refineries could manufacture the counterfeit, could it be them? Not that the Chinese have ever made fake copies of anything. And incidentally, China is the leading producer of Tungsten in the world. Well then, on to the impact of counterfeit coins on gold trading: GLD ETF is the case in point. GLD ETF ( StreetTracks Gold Shares), was born just five years ago in November 2004 and is the first ETF in the US to allow stock traders to directly gain price exposure to a physical commodity (gold and silver). Stock investors could buy assets to track the price of gold, get immediate and easy knowledge about gold then speculate-buy or sell. It is the second largest in the world behind SPY, with a mammoth 1117 metric tonnes of gold bullion in trust worth for share holders. GLD, in fact has more gold bullion than the central banks of China, Switzerland, Japan, Europe and India. The influence of GLD is such that its trading activity can affect the global prices directly. So, are they going to drill all their bars to tell the real ones from the fake ones? Are they going to tell anyone if there is even just one fake gold bar somewhere? What will happen to investors billions if it turns out they hold fake gold? GLD finds a distinction between 'gold' and 'investment in gold'. And it's not clear what these investments in gold are, and they could be anything even remotely related to gold. It leaves none the wiser as there are no independent third party audits. The value of the fund will have to be de-pegged from the value of real gold if it doesn't hold real gold and will likely collapse and with it the billions in retirement investment. People affected would be more as there may be more than one person owning the same asset and hence no automatic right to physical holding. Just check out some of the 'risk factors' mentioned in the prospectus of GLD: "The Trust's gold may be subject to loss, damage, theft or restriction on access. " "The Trust may not have adequate sources of recovery if its gold is lost, damaged, stolen or destroyed and recovery may be limited, even in the event of fraud, to the market value of the gold at the time the fraud is discovered." "The ability of the Trustee and the Custodian to take legal action against subcustodians may be limited, which increases the possibility that the Trust may suffer a loss if a subcustodian does not use due care in the safekeeping of the Trust's gold." If at all anything happens, GLD can easily shake off its role in the whole game. Still, no one is ready to bet on a collapse of the gold market, yet. Further, UBS and Goldman and Sachs predict gold prices rising this year. Meanwhile, India the world's largest gold consumer has bought 200 metric tons of Gold from IMF, to protect against the weakening dollar. And China, Brazil and Russia are expected to buy the rest of the gold offered by IMF of about 403.3 tonnes. So, to the question asked in the earlier part about gold as long term investment, should one still track the price of gold? Yes, on reliable derivatives like gold-quote.net. After all, it's better to be wise than lucky. © gold-quote.net 2009, all rights reserved. Republication or redistribution of gold-quote.net content in part or in whole is explicitly prohibited.